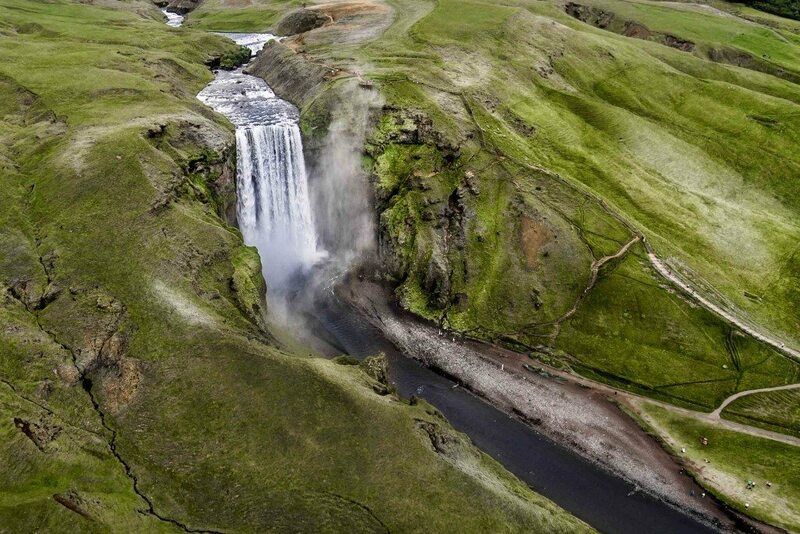 Skógafoss is a powerful waterfall located in the village of Skógar in the South coast of Iceland. It forms when Skógá river falls from the cliffs of an old shoreline. The waterfall is 25 m wide and has a fall of 60 m. This waterfall marks the beginning of a popular hiking trail that leads up to Fimmvörðuháls, between the two glaciers Mýrdalsjökull and Eyjafjallajökull, to Þórsmörk and ends in Landmannalaugar. The legend says the first settler at Skógar, Þrasi Þórólfsson, hid a treasure chest filled with gold behind the waterfall and that is the reason why sometimes the waterfall glitters golden. Once a young man succeded in catching the chest but only managed to get grip of the chest‘s ring before it dissapeard. This ring was used for the door of Skógar‘s church but is now for show at Skógar Museum.